Welcome to the first of a regular training series in GunNews titled “Drill of the Month” (DOTM). The goal: to help you become a better shooter, both for self-defense and competitive purposes. Ammo and time are both valuable. Don’t just make noise at the nice, heated indoor range this time of the year. Especially while trying not to shoot (too much?) worse than the people on either side of your lane! That’s right. Don’t just punch holes in a target the size of Sasquatch! Here’s a great target and exercise that will help make you a MUCH better shooter. This month’s drill: Dot Torture. While it sounds deceptively easy, it proves challenging even for good shooters. It requires 50 rounds and about ten minutes to complete, tops. It also normally requires drawing from a holster, but if range constraints prevent you from drawing and shooting, start at the low ready. If I did the low-ready alternative, I’d then practice fifty dry-fire draws and re-holsters at home with an unloaded gun when I got home. These targets can be found at most gun ranges. If your local range does not have them here is a link to a printable target. 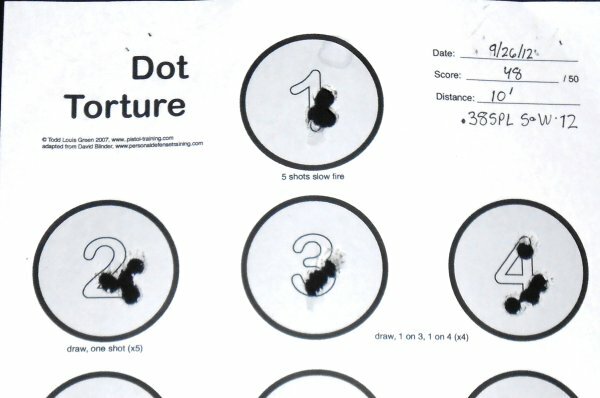 https://pistol-training.com/drills/dot-torture Or google “Dot Torture Target” and print it out on your printer for free! Better still, the instructions are printed right beneath each circle you will be putting your shots into. Start at 3 yards. You have to get all 50 hits to pass. Once you can shoot the whole drill without a single miss, either increase the distance or add time pressure. For instance, try to finish the entire drill in under 5 minutes while maintaining 100% accuracy. Dot 1 – Draw and fire one string of 5 rounds for best group. One hole if possible, total 5 rounds. Dot 2 – Draw and fire 1 shot, holster and repeat for a total of 5 rounds. Dots 3 & 4 – Draw and fire 1 shot on circle #3, then 1 shot on #4, holster and repeat for a total 8 rounds. Dot 5 – Draw and fire string of 5 rounds, strong hand only, total 5 rounds. Dots 6 & 7 – Draw and fire 2 shots on #6, then 2 on #7, holster, then repeat for a total 16 rounds. Dot 8 – From low ready or retention, fire five shots, support hand only, total 5 rounds. Dots 9 & 10 – Draw and fire 1 shot on #9, speed reload, fire1 shot on #10, holster and repeat X3, total 6 rounds. Knock this drill out the first time and you’re already a very skilled shooter. Do it again and count any rounds that touch the circle as a "miss". Then once you've managed that, step back and try it again from five yards, then seven. For a mere 50 rounds, you're working on multiple skill sets! Your improved skills will be priceless to you, both for competition and self-defense. This entry was posted on January 23, 2018 at 8:57 pm and is filed under Blog. You can follow any responses to this entry through the RSS 2.0 feed. Must be printed on dot matrix printers?? ?